“Solving studies is well established as an effective method of chess improvement. 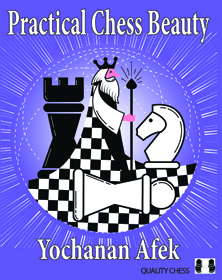 In Practical Chess Beauty one of the world’s greatest study composers, Yochanan Afek, shares his finest creations. Publishers claiming “our books are great” always look suspicious, given our obvious bias, but this book really is great. There have been so many times in editing when we have boggled at a move, and said: “That can’t possibly work!” But then it does. The author has framed his book to be useful for the practical player seeking improvement, but it also works wonderfully as pure entertainment. It’s too early for an excerpt (maybe next week) and I will guess at a publication date in late October or the start of November. I will give one example from the book. 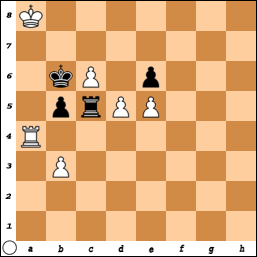 White to play and win (I will give the solution next week). The main line is only 5 moves long, but you will do well to spot the winners and the best defensive try. Stretch your brain – do not switch on that engine. Great, this is indeed something QC hasn’t done before 🙂 . I am sure this book is going to be amazing. so finally you succeed to get mister Afek to deliver an original work! I have been in Yochanan Afek’s training group in Utrecht, The Netherlands, since 2007. I have always found his lessons, books inspiring. Yochanan has a great passion for chess and when I haven’t worked on tactics or endgames for some days, I remember the first advice he gave me: ‘Solve tactical puzzles every day, Jeroen, make it a habit!’. It sure has helped me to reach a 1900+ FIDE rating after being an 1700/1800 rated player for decades, and I am still improving. I am looking forward very much to this new book by Quality Chess! Extremely exciting ! Afek is my favourite composer because he is overall a strong over-the-board player, so his studies are simple, clear, practical and that makes them even more beautiful thanks to his inexhaustible imagination. Resolving practical studies is also the best training just before a tournament, to polish a tactical preparation. Thank you. I have been pestering him for a decade to get him to write it. And it is simply wonderful. I think this is a good chance for book of the year. Reading the description, this book sounds like a rehash of his book from a year ago by another publishing company (written by him) called “Extreme Chess Tactics”. Is this basically “part 2” of that? Is is a complete re-write of it and those of us with the first one shouldn’t get this? Or are they completely different like apples and oranges? I have noticed this author uses some quirky terminology. For example, what he calls “Battery Play” is what most refer to as a “Discovered Attack”, whereas, at least in the United States, a “Battery” is typically two heavy pieces on the same file or a Queen and Bishop on the same diagonal (i.e. WRd1 and WRd2 or WQb1 and WBb2). Not in the slightest. But I have to admit that both books are about chess… So you are not 100% wrong.